Throughout the month of September, Bookmans fought the good fight against banned books and censorship! You might have participated in one of our Banned Book events or even bought one of those mysteriously wrapped books at our stores from our Blind Date with a Banned Book displays. Just because September comes to an end, our rebellion against censorship does not have to. 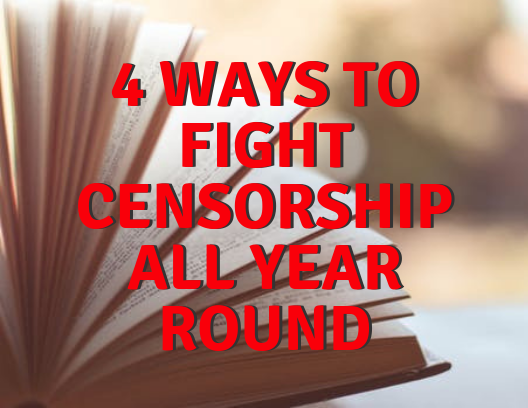 Here are some ways to celebrate resisting censorship all year round. Birthdays, Christmas, Arbor Day – whatever holiday you are keen on, give a gift that keeps on giving. While you’re at your local Bookmans shopping for tchotchkes, grab a copy of your favorite banned book or movie to give a little flair to your gift. Nothing says “Happy Sibling Day” like giving your brother a copy of the 1999 film The Boondock Saints. You can even make your presents themed. Invited to a New Year’s Eve bash? Bring your host a bottle of champagne (or sparkling apple cider), party hats and confetti poppers, along with a copy of F. Scott Fitzgerald’s The Great Gatsby. Make sure they drink responsibly and not look longingly into the green light outside their window. We’ve seen them pop up near neighborhoods, elementary schools, and at parks, just because. Little Free Libraries are not only a cute addition to the block but a way for others to expand their horizons by simply “taking a book and leaving a book.” Check to make sure that there are a couple of banned books at your local Little Free Library. If not, donate! Be sure to mention why the book you left is censored and why it is important to read it. 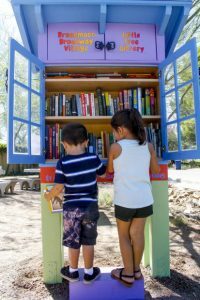 For more information about Little Free Libraries, check them out here. When I mentioned to my daughter that the book we were reading for bedtime was banned in most schools, she could not believe it! “How could anyone be offended by Harry Potter,” she said, “He’s just a kid!” Our kids crave stories, whether they are banned or not. Exposing them to all sorts of age-appropriate banned or challenged books introduces them to ideas that might not be accessible to their worldview. Whether it is Harry Potter, Charlotte’s Web, or Winnie the Pooh, make it clear to your kiddos that sometimes stories get censored for reasons that might not make sense. It is up to them to challenge these rulings. After all, a little knowledge never harmed anyone. This might be the most important way for us to not censor the world around us. Storytelling is all part of the human experience. If we agree or not, opening our minds to another’s perspective challenges us not only as readers but as human beings. Don’t know where to start? Catch one of the Backroom Book Clubs or Banned Book Clubs at a Bookmans near you!